Sturdy and scientifically designed with the latest in lightweight comfort and heavy-duty protection, the HAIX® Airpower XR200 electrical hazard chainsaw safety boots have an anatomically formed composite toe cap to protect your tender assets while giving you enough room for your toes to move. Built in arch support helps to absorb the weight of your body with each step you take. Made for men and women who desire comfort and quality. Most people don’t realize how important good safety shoes can be while on the job. Not only from the safety standpoint, but from the comfort and usability standpoint. You need to be able to keep your mind on your job and not on your aching feet. The HAIX® Airpower XR200 electrical hazard chainsaw safety boots incorporate an array of features to meet a wide variety of job demands. 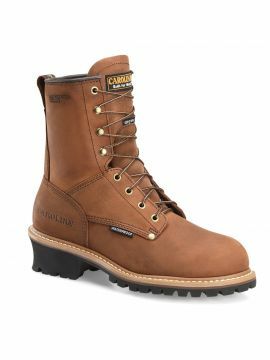 When you have a tough job to do, you need strong logger boots. Out in the elements, you can rely on the quality and European craftsmanship which goes into each pair of HAIX® Airpower XR200 electrical hazard chainsaw safety boots. Forestry workers will enjoy the durability and strength of these versatile electrical hazard chainsaw safety boots Two zone lacing lets you maximize the fit of your boot, while the ankle support and protection keeps you on your feet on and off the trail. The Airpower XR200 contains minimal seams for more durability as there is less chance of seam failure especially when hiking through rough brush. The rubber sole gives extra grip and slip resistance too. These electrical hazard chainsaw safety boots have built in cut protection keeps feet safer from accidental chainsaw equipment cuts. Certified to ASTM F 2413-2011 and CAN/CSA Z195-2014 for its safety toe, sole puncture, and electrical hazard protection, the Airpower XR200 also offers European Class 1 (20m/s) cut protection. Waterproof and breathable with a built in climate system to keep your feet at a comfortable temperature, Airpower XR200 is a perfect all around choice for many job applications. Our clothes are so tough, they don’t just hang out in your closet, they do chin-ups until you’re ready to wear them. Reach real people at Arborwear. It’ll be like a family reunion – without all the questions about what you’re doing with your life. Yes, we want you to love your Arborwear. But even more important to us and your safety is that your outdoor clothing and boots fit you properly. Let us help you get the right fit. We hate spam as much as you do. We promise not to sell your email address to anyone else. Support Arborwear retailers. They're good people with pants.